Lisa Guinan is a fully qualified and registered Naturopathic Herbalist with many years experience in teaching people about medicinal plants and how to use them for health. She recognises the peace that can be found by slowing down and spending some real time in Nature. She brings this stillness into her work so that people can more easily relax as she brings alive the wonderful world of plant medicine. 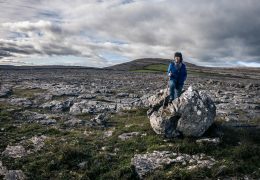 County Clare is thriving with an abundance of wild plants and herbs that have been used to make traditional medicines and cures since ancient times. Irish Herbal Roots will take you on a journey, bringing to life the fascinating wonders of plant medicine. Once your eyes are opened to the medicinal value of many common ‘weeds’ that sing in the fields and hang in the hedgerows, you will never walk through nature in the same way again. In fact every step you take becomes a treasure hunt of the kind that is known only too well by curious children, left to roam freely in Nature. 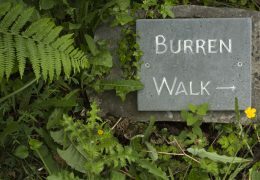 Herb walks take place in the Burren and surrounding area and consist of a walk in Nature with specific attention drawn to medicinal plants and flowers along the way. Folklore, traditional cures and modern medicinal uses will be woven into the tale of each wild herb and flower, bringing them to life whilst also glimpsing insights into traditional Irish culture. The Art of Natural medicine making. Traditional Old style cough bottle made from Wild Elderberries or other seasonal herbs. Wildflower Healing Salve (an herbal rub made from a selection of wildflowers and used for all sorts of skin healing). Whether you are interested in natural medicine making for health reasons, historical reasons or just out of plain curiosity, these workshops promise to be an entertaining and informative way to spend your day. As an experienced Herbalist, Naturopath and Health Coach, Lisa is available for professional one on one health Consultations. If you have a specific health issue, a particular weak spot in your physiology (for example frequent chest infections) or if you simply wish to operate at your very best (with good stamina and strong immunity), then a personal consult may be the way forward. Lisa can blend a personalised herbal tonic which matches your physiology most accurately for optimal results. In general, energy work offers an opportunity to experience ourselves as more than a physical and mental being. 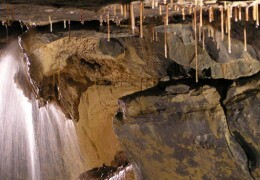 We have the opportunity to experience ourselves in a peaceful, expanded state which can bring lasting benefits to our body, mind and emotions.Magdalena Energy Sessions are a wonderful way of dropping into that most inner part of yourself, for connecting deeply and gently, for coming home to yourself and allowing self to be nourished.